Each of us knows the old wives’ tales that have been passed through the grapevine for as long as we can remember. Well, sometimes there is truth to them and sometimes it’s just a big fat lie. The Internet is the major medium through which these old wives myths have been spreading. The Internet is known as the ocean of knowledge. You can get lots of great information about carpet cleaning today, but you need to understand what’s right for you and your carpet. When it comes to natural cleaning, they recommend vinegar as the natural cleaning product that can eliminate stains from the carpet fabric. Although it is a disinfectant, it cannot eliminate stains! Environmental Health Scientist has tested vinegar along with other natural cleaning products. They found that vinegar was the least effective solution. There are many people recommend using baking soda with vinegar. However, this will probably not remove stains either. You will end up making a paste that will have a hard time removing. Moreover, there are some websites recommend using a solution of vinegar and baking soda. However, it is dangerous. This can create parasitic acid. It can cause irritation on the skin and can also create breathing issues. The reality is, steam cleaning is the most recommended cleaning method by the manufacturers. It is a proven method when you are looking for deep cleaning. They also use water in dry cleaning, but it only penetrates and cleans the top surface of the carpet. Check with your carpet manufacturers for the cleaning method or ask your local carpet cleaning professionals. Water may seem harmless. However, it can sometimes harm more than good. If you use water on stains like ink, then there is a possibility that the stain will spread and become a permanent part of the stain. Damping a stain can make it simple to remove the ink. However, use club soda instead of regular water. Again, if you are dealing with a professional cleaner and if the guy is steam cleaning your carpet, there is no reason for water to go behind the backing of the carpet or the pad. Yes, it is only possible if the cleaner is not trained and leaves your carpet wet, which will lead to mold growth. So, you need to make sure you appoint an experienced professional for your carpet cleaning. 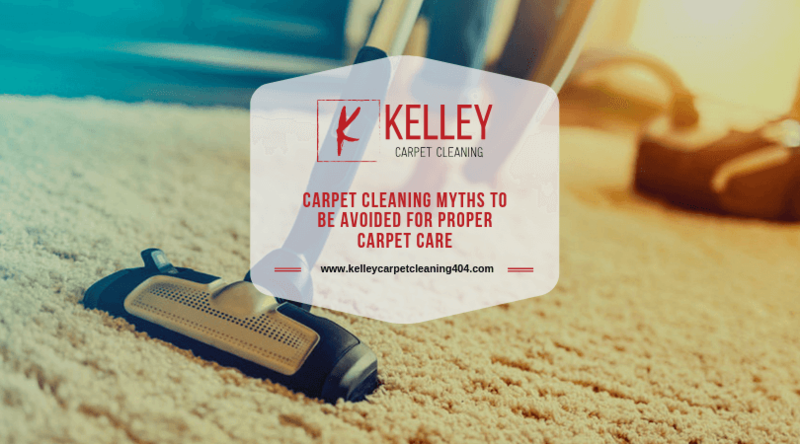 Myth #5: Routine Carpet Cleaning Will shrink my carpet, Leaving it Damaged Forever. Actually, unless you leave your carpet soaked when you’re done with cleaning it, your carpet won’t shrink. The reason behind the shrinking of the carpet is leaving it wet for a long period. You can prevent these issues by making sure you dry your carpet thoroughly when you are done with the cleaning process or by renting drying machines. It doesn’t matter what kind of carpet you have or what kind of cleaner you use, it’s always wise to read the instructions that come with both the machine and the cleaning products. Manufacturers will always provide an instruction manual on how to prepare the machine. Make sure you use it safely and correctly to avoid accidents. Contact Kelley Carpet Cleaning if you need any professional carpet cleaning services in Newport News, Yorktown, Williamsburg, and all nearby areas today! Call us at (757) 504-2267. Get in touch with us on Facebook for more updates.